Hello faithful idolreview readers! While American Idol may be over, this blog is remaining up and online for posterity. And also, in the hopes that one day this show will be revived (hopefully with Simon). In the meantime, follow me on twitter or instagram. Happy reading! 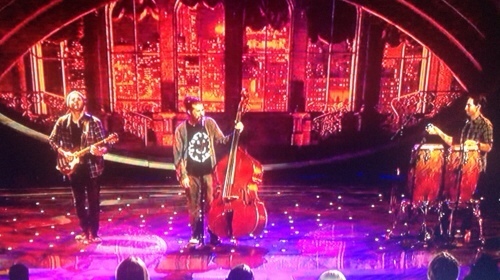 My biggest problem with many of the performances tonight were the arrangements. I know top three week is probably all a little last minute–after spending two days at the hometown visits, they have to come back and learn three songs in three days. Since none of the songs were chosen by the contestants themselves, it is difficult to forge a personal connection, and that was pretty evident. 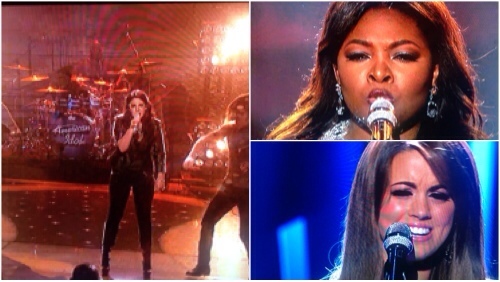 Kree seemed the most disconnected from tonight's performances. I liked her on the upbeat The Band Perry song, which was my favorite of the Kree Three (ha, I crack myself up), but even with that one, I think she holds back her emotion a little too much. She has her guard up. She has had a tough life, and has an enormous amount of life experience to tap into, but she needs to attend the Fantasia school of emotional performances to connect her real life with the stage. Overall she was the weakest of the night. Candice's vocals are master. effing. class. I mean, she has never ever hit a bum note. And even when her runs aren't up to her perfectionist standards, she is still amazing. My biggest problem with Candice tonight were all of the bombastic production arrangements–totally unnecessary and quite honestly, unoriginal. It makes me sad to see that this is what the idol production puts together when left to their own devices. For Angie, this was one of her best nights overall. Her growth as an artist is undeniable–she has lost *almost* all of the pageant-y-ness about her and while I didn't love all of her vocal choices and song arrangements, at least I believed her. So, who did you like tonight? Who is heading home tomorrow? And really, can't we just vote Randy off instead? Is it already the top four? Sounds like they have to have a few non-elimination rounds because how are we really going to stretch this out another month? 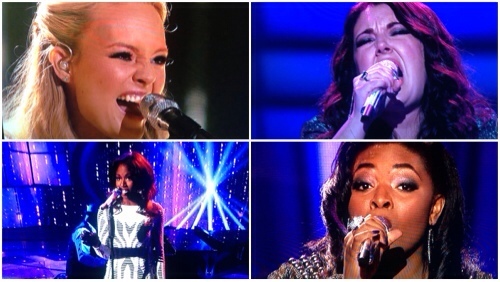 Tonight we get a triple dose of each contestant–Two solos and a duet. These are all strong ladies and any one of them could conceivably win. I am still recovering from watching the last performance on repeat. Really, because I could have just watched two hours of that. Oh Candice, you pull a schooling out of your back pocket and show everyone why you came to win. (Mariah also pulled glitter out of her back pocket. Does she travel with handfuls of glitter? Just wondering.) In the words of Ms. Minaj, #werk. And then, at the complete other end of the spectrum, there was Lazaro. Oh boy. In the words of Peter Griffin, “That happened. And we let it happen.” You know Nigel loves putting out a good sob story (Danny Gokey, exhibit, A). And it has clearly run away with itself, per usual. I called this from top 20 night, and the situation has deteriorated. Dude is clearly the worst, and what's worse is he will not go home tomorrow. Now that we've touched on the best and worst of the top six, lets talk about the mid-field contestants. Kree is solid second place for me. Her vocals are consistently effortless, but she just lacks an edge of emotion on stage. I put Amber in third place. Her vocals are flawless, too, although tonight her second performance was a bit shaky. She is very commercial, but lacks an emotional connection many times, as well. In fourth place is Angie–the inconsistency ranks her below the rest. When she's up, she's up. When she's down, well, it's pretty bad. I don't think her vibe and the theme weeks get along well and she has song choice issues. Finally, in an unfortunate fifth place is Janelle. It was obvious she was the weakest girl heading into the top ten–I still think Aubrey deserved that spot. And although Janelle has managed to have several outstanding performances, I'm not sure that has shifted her spot in the pack. Unfortunately, because of America's obsession with Lazaro, I think Janelle will go home tomorrow. They may decide to use the save on her, but I also wouldn't be surprised if they saved the save for next week when one of the other four will inevitably get booted before Lazaro. As always i *plan* to put up my full review up in the AM, but you know, day job priorities and such have been preventing that from happening the last few weeks. Let me know what you thought about tonight's performances! Candice on repeat! Candice on repeat! I Wanna Rock! (Boom Boom). Oh Nigel! Your futile attempts to quell the long-time idol watcher with never-before-done theme weeks is cute and all. I appreciate you trying to change it up. But for the sake of the integrity of the entire Rock and Roll genre, please never require Lazaro to sing Rock music ever again. The thing about this idol season is there is no surprise. I could have written the review yesterday. Or just used the review i wrote last week and never posted because i am a lazy blogger. Candice and Kree were great! Amber and her legs were great! Lazaro was train wreckage. This lack of interest sort of makes me long for the days of crazy Sanjaya hair styles–at least I wondered what the hell he would do! So, what did you think? Will Kree or Candice actually win this thing? Were you impressed by any of the performances this week? Let me know in the comments! It was another night of the girls killing the boys, and if there is any justice left in the idolverse, Miss Amber Holcomb will live to see another week, and either Burnell and his tighty whitey suit or Lazaro and his poor enunciation will be hitting the road. And though Devin may be increasingly boring me, his vocal chops earn him at least one more week. On a night with two memorable alumni performances, it just further emphasizes Paul's downward spiral and it would be doubtful at best to see him in a career outside the Idol bubble. Not that we savvy idol viewers ever thought that, but perhaps Nicki needed a dose of reality. But lets back up a little. Tonight we get to see a glimpse of behind the scenes Jimmy, acting like a total douche. But while he may be a douche, he is a correct douche. All of the reviews he gave of last night's performances were spot on. Although calling Lazaro a flat out liar may have crossed the line–I mean the kid may not be a great singer, but he is just a scared kid on a reality TV show. Go easy on him, Jimmy. I especially want to commend Jimmy for his spot-on review of Angie. Last night's performance was too broadway, and I didn't see that note from the judges or anywhere on the interwebs, either. It can be corrected, but needs to be addressed asap. So alumni performances? Casey Abrams is better than any of the guys in the top 10. I was always a marginal Casey fan, but in comparison to these male idol contestants, he is a phenom! Loved his performance. When I heard Jessica would be on, I was hopeful for a Jessica/Candice reunion moment on camera! But alas, there was no time to do the weekly ranking, not to mention have a meetup stage left. Maybe they can duet in the finale? A girl can hope. The thing about her single is I know this is the type of music that gets radio play, but she is so much better vocally than that song. At least she can dance, so the whole dance track thing works for her. But lets talk about the reason we actually tuned in tonight: the killings. Paul leaves on a jetplane tonight, and while he was somewhat deserving of another week (It was Lazaro's turn for the boot, clearly), I am not at all shocked he went home. But the other members of the bottom two were awful for me. Amber? really? Devin? He is the best guy left. I know the wonders of Candice and Kree might water down the fan base for Ms. Holcomb, but get on the Amber train, people! She sings through smoke machine malfunctions! Girl needs a BREAK. OUT. PERFORMANCE. stat. With Motown week next week, she has the potential for greatness. She needs to pick out an unexpected song with an Amber twist. I know this can happen–you've got this, Amber! So is anyone out there that was shocked about Paul's departure? Please identify yourselves in the comments.